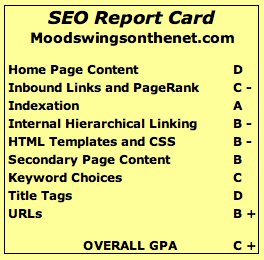 Our “SEO Report Card” for this month is Moodswingsonthenet.com. The CEO of Moodswings, Elizabeth Bighorse, requested this review, and she told us that the company has just finished a re-launch of its “multiple sales channel” site. Moodswings focuses on urban, rockabilly, tattoo and alternative styles and seeks to expand its market of trendy clothing, gifts and accessories. Bighorse says they are currently half way through a search-engine-optimization initiative, but she could have fooled me! With that, let’s take it away. Starting at the Moodswings home page, the title tag is devoid of any effective keywords. Furthermore, there is very little in the way of body copy, as evidenced by the SEO-Browser.com tool. So in all, the home page is very weak and does not convey much in the way of keyword themes. Meta description tags on many internal pages are not sensical phrases and sentences, but instead spammy keyword lists (see the above-mentioned Vegan Wallets category page, for example). The meta keywords tags (which are not supported by any of the three major engines, I might add!) are overly long and look spammy. (I counted 68 words on the Vegan Wallets page). The site has canonicalization problems as well. (Canonicalization refers to having a single URL for each web page.) For example, both http://www.moodswingsonthenet.com and http://moodswingsonthenet.com load as unique but duplicate pages. One should redirect to the other. The Moodswings blog, located at http://moodswingsonthenet.blogspot.com/, is on a domain the company does not own. So if the company decides to change hosted blog services from Blogger.com to WordPress.com, or if Moodswings decides to host the blog itself on a WordPress installation, it will have to abandon the blog at blogspot.com. Blogspot.com belongs to Blogger. Moodswings could have signed up for the free “custom domain option” with Blogger and then gotten its own domain name. WordPress.com and TypePad.com also offer custom domain options, but they both charge a small ongoing fee. Further issues with the blog include no good keywords in the post titles, and misdirection when clicking on the titles. Specifically, clicking on any blog post title listed on the home page leads to the Moodswings home page instead of to the post’s permalink page. The PageRank score of 3 out of 10 is poor. Inbound links are poor. The Yahoo! Site Explorer tool shows 603 links to the site, but many of those supposed links are false positives and not links at all. For example, Site Explorer reports that many dozens of links are coming from Stylehive.com, but Stylehive.com only has an img tag (to manage images) with a Moodswingsonthenet.com URL, which loads (“borrows”) Moodswings’ images. More accurately, according to the Linkscape tool from SEOmoz, there are only 28 domains linking to the Moodswingsonthenet.com home page. With so few inbound links to the home page, it’s unlikely search engines will put much trust in the site. Finally, the site has an XML sitemap as well as an HTML site map. The XML sitemap is set up for auto-discovery in the robots.txt file, which is good and means they don’t have to keep submitting the XML file URL to the engines. URLs are search engine friendly, use hyphens to separate words, and have the product or category name represented in the URL. Kudos for that. From the sounds of it, Moodswings is motivated to improve its SEO performance, so hopefully this site critique will be well received and the staff there will act on it quickly. Moodswings has a ways to go, but much of this is easy to address. Drop the meta keywords, stop keyword-stuffing the meta descriptions, do some keyword research, put good, relevant keywords in the title tags, H1 headers, and body copy, do some link building (send out some free product samples to bloggers, for example, to consider a review), and 301 redirect the non-www URLs to the www versions.